By 1965, Cosby was one of the hottest nightclub comics in America. Enter writer/actor Robert Culp, who had written a script where he was to star as a James bond-style secret agent. Culp brought the script to producer Carl Reiner, who told him to show it to producer Sheldon Leonard, who was developing a new series called “I Spy“. Leonard soon signed Culp to star in his new “spy series” as spy and “tennis bum”, Kelly Robinson, and now set about to find Culp a co-star. The co-starring character in “I Spy” was named Alexander Scott and was originally intended to be an older, mentor-type character- oh yes, he was also supposed to be Caucasian. But one night, after catching the stand-up comedy act of Cosby, Leonard’s fertile mind started percolating. He felt Bill Cosby would be perfect in the role of Alexander Scott. Of course, nowadays, the solution would be simple: just hire Cosby. But this was 1965 and the times were a bit different. If Cosby was hired, this would be the first time in the history of television that a black American would co-star in a dramatic series. In an early episode, “Danny was a Million Laughs”, guest actor Martin Landau made a racial joke at Cosby’s expense. Both Culp and Cosby bristled at the crude “humor” and insisted no racial references would ever be made again on the show; for the rest of the show’s run, that’s exactly what happened. Both agreed that “our statement is a non-statement”, Culp later recalled. For its debut 1965-66 season, “I Spy” was a hit and rated in the “top twenty” most popular shows in the coveted Nielsen ratings. All was not smooth sailing though, as you might expect. Some southern affiliates refused to air the series due to an “African”-American actor being shown on the same level as a white actor. Cosby also received, for the era, the seemingly obligatory mounds of hate mail and death threats. Aside from these cruel caveats, “I Spy” became established as a highly creative, as well as popular show, beloved by its millions of loyal fans. For those who haven’t seen the show, working as two undercover agents, Kelly Robinson’s cover was as a tennis player, while Alexander Scott’s was that of his manager/trainer. Not only was Cosby’s character never subservient to Culp’s, Cosby’s “Scotty” was portrayed as the smarter of the two, being a Rhodes Scholar who was fluent in several languages. Culp’s “Kelly” was a “tennis bum”, a drinker and womanizer, with less discipline than the more level-headed “Scotty”. Beyond that, the two were shown as equals. For his role in “I Spy”, Cosby won three consecutive Emmy awards for “Outstanding Lead Actor in a Drama Series”, in each season of “I Spy’s” brief three-year run (beating out his co-star each year!) “I Spy” also won a Golden Globe award for “Best Dramatic Series” in 1967. Finally, in 1968, after three seasons (82 episodes), “I Spy” was canceled, but not before Bill Cosby did something no black American had ever done before, co-starred in a dramatic TV series. The first African American to star on any network TV series was Ethel Waters in Beulah, which ran on TV from 1950 to 1954 (previously being on radio starting in 1945). Nichelle Nichols very soon became another to star in a major network TV show, though she nearly left the show. Martin Luther King Jr. convinced Nichols (who incidentally later went on to work for NASA), to continue on with the role of Uhura after the first season of Star Trek. Nichols stated he told her not to leave the show because she was not only playing a black person as a main character on TV, but she was also playing a character that didn’t conform to the stereotypical black person of the day usually portrayed. Rather, Uhura was portrayed as an intelligent member of the crew and an equal to those around her. In one episode of “I Spy”, Scotty is being tortured by enemy spies and is asked his name, to which he replies, “Fat Albert”. 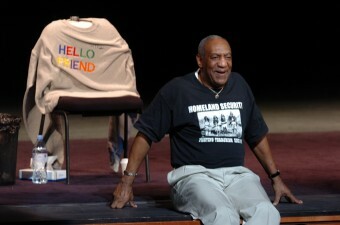 Cosby would go on to create the show “Fat Albert and the Cosby Kids” four years after “I Spy” concluded. Robert Culp and Bill Cosby were to remain close friends until Culp’s passing in 2010. Isn’t he in court for something? With recent events maybe this should be removed? Why remove this? Regardless of anything Bill Cosby has done since, it doesn’t change the fact that he was the first African-American to co-star in a dramatic TV series. Bill is good, period. Bill was breaking ground and made history in this country of prejudice. What he did or did not do, we will never be 100% so who are you to say something ? Bill Cosby worked all his life to bring black and white people and men and women together. Certain individuals and groups who profit by creating mistrust and hatred between black and white people and men and women have targeted him for destruction. We will unite and destroy these groups. The legacy and love and laughter that Dr. Cosby has created over his whole life will never die. Those who are lying about him have disgraced themselves and will be seen for what they are. Binge Watching I SPY right now, as Netflix is letting it expire. I am honouring the human being accomplishments of Bill Cosby and not his failure as a human being. I will respect his work presenting a Black Man in a positive, educated and classy character on I Spy. I will respect his work as a BB Coach. I will respect his representation as an upper middle class physician with a family of positive role models for any colour fathers, parent, husband, son. I will respect even Fat Albert for providing a positive cartoon for Black Youth.